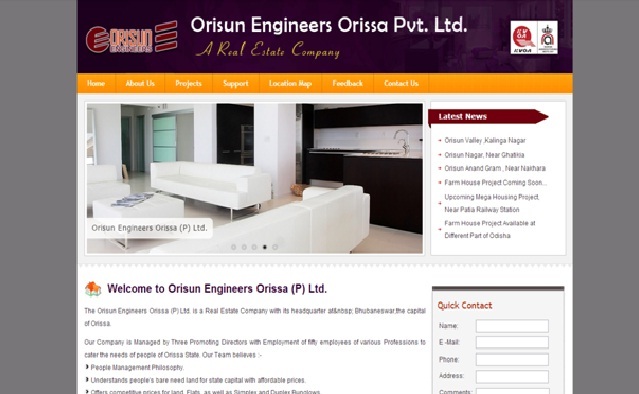 Orisun Engineers Orissa Pvt Ltd is a renowned real estate development company located at the temple city Bhubaneswar, Odisha. This company is managed by three professionally experienced directors and above 50 employees as contractors, supervisors, architects, sales executives, marketing managers, hr executives, and other official staffs. This company is committed to deliver affordable housing projects near and dear locations of the city to their esteemed customers. This company is planning to provide plots in twin city (Bhubaneswar - Cuttack) with home loans facilities from leading banks. The features of the project are 30 ft and 20 ft roads connected to the every plots, quality electrification, 24 hrs water supply, and project with BDA and BMC residential zone with proper approval, installments facility, and pollution free environment. This project is located at Paikarapur, Near CET Engineering College, Bhubaneswar, Odisha. This project provides cent percent litigation free lands, great parking space, pollution free and healthy environment, easy installment facility, and home loans. This project is a distance of 2 kms from National Highway, 7 kms from airport, 3 kms from Sum hospital, 2 kms from purposed bus stand, 4 kms from Baramunda Bus stand, 1 km from DAV public school, and 6 kms from railway station. This project is located at Shankarpur, Near Khandagiri, Bhubaneswar, Odisha. This project provides 100% litigation free lands with immediate registration and possession with all modern facilites. The features of this project are 30 ft main road and 20 ft inner road well connected to each plot, pollution free and green plantation around plots, great open space for parking, project with BDA and BMC Apporval, and quality electrical works. This project is a distance of 700 metres from NH, 5 kms from Airport, 3 kms from Sum hospital, 2kms from purposed bus stand, 3 kms from Govt bus stand, 3 kms from ITER College, 1 km from DAV school, 1 km from Xavier school, and 8 kms from railway station. This project is located at Near Satya Sai Enclave, near Emami hospital, Khandagiri, Bhubaneswar, Odisha. This project provides litigaton free lands with electric transformer, immediate registration and possession facility, and project with BDA approval. This project is a distance of 800 metres from NH 5, 8 kms from city railway station, 3 kms from Baramunda bus stand, 3 kms from Sum hospital, 5 kms from Airport, 1 km from DAV school, and 3 kms from ITER college. This project is situated at Nakhara, Near East College, Cuttack, Odisha. This project also provides 30 ft main road and inner roads with 20 ft to each plot, installment facility and easy home loans. This project is a distance of 800 metres from NH, 7 kms from Airport, 12 kms from Rasulgarh, 15 kms from Vani Vihar, 15 kms from Link road, 4 kms from Nakhara square, 1 km from DPS kalinga school, and 9 kms from railway station. This project is located at Jagamara, Bhubaneswar, Odisha. This project provides cent percent litigation free, 30 ft main road and 20 ft inner roads well connected with each plot, quality electrification, pollution free environment, quality fire security, quality water supply, apporved by BDA (Bhubaneswar Development Authority), and near to DLF multi complex project. This project is a distance of 800 metres from NH, 5 kms from Airport, 4 kms from Sum hospital, 2 kms from Baramunda bus stand, 1.5 kms from ITER College, 1 km from Dav Public school, 1 km from Xavier school, and 2 kms from Lingaraj railway station. 15% extra cost for corner plot and 500/- membership fees for each customer.